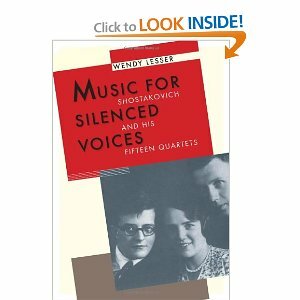 Just finished reading Wendy Lesser's luminous book about Shostakovich's string quartets, Music for Silenced Voices. I recommend this to anyone who wants a starting point into the composer's life and work. Lesser, who is the founding editor of the journal The Threepenny Review and lives in Berkeley, is not a professional musicologist and approaches the subject partly as a layperson who's simply caught the bug for Shostakovich's music and partly as a reporter/researcher, delving into archives to dig up information on the composer and interviewing a wide range of people who are familiar with his string quartets and other works. She often quizzes the members of string quartets that play the works for their input. Comments from the members of the Emerson, Alexander and other great contemporary quartets are one of the great delights of reading the volume. "The feeling of dissonance and dark, harmonically ambiguous tunelessness that Shostakovich uses elsewhere is present, but although it is not entirely pleasurable, it somehow feels less anxiety-ridden than in the earlier quartets." If there's one overriding thesis that runs through the book, it's the simple yet compelling idea that the quartets provide a more powerful insight into the composer's life and approach to composition than perhaps any other of his works because they flew under the authorities' radar so weren't scrutinized as carefully. While Shostakovich's symphonies and opera (Lady Macbeth) were dissected and sometimes condemned in a very public way, Lesser argues that the quartets could be a more honest reflection of the composer's thoughts and feelings and more musically experimental because no one besides a few insiders was paying attention to these "minor" works. "It is hard to say precisely why this plucked chord sounds so jazzy...but it is so noticeably a jazz moment that it stops the ear every time...What is astonishing is that the Party watchdogs missed it. But that, for Shostakovich, was the beauty of the string quartet medium. He could toy with cacophony, immerse himself in irony, indulge in all his darkest, least acceptable moods, and not be called unpatriotic, because nobody who cared about such labels was listening to these compositions." 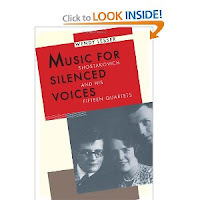 Like many studies of Shostakovich's music, the author spends a lot of time trying to connect what she's hearing in the quartets to theories about the composer's life. Refreshingly, however, Lesser doesn't prescribe to too much loose theorizing about what the composer may or may not have been going through in his life at the time of writing a particular quartet. She alludes to the well-trodden history of "hidden meanings" that musicologists have unearthed in Shostakovich's works but often lays out competing theories or writes with a note of skepticism, which makes the book feel balanced. I suspect that some hard-bitten Shostakovich aficionados may find failings in Music for Silenced Voices -- that it perhaps doesn't say anything new about the composer that they haven't heard already. But as a warm and clear entry-point guide to a body of Shostakovich's work that doesn't get a great deal of attention, it's wonderful. On another note, the intellectually-astute and completely wacky comedian Will Franken sent me a link to a video made at one of his recent stand-up shows. It features the artist engaging in his own inimitable way with the first movement of Beethoven's Ninth Violin Sonata. Watch Will and Ludwig in action here.